Nominations open Monday, April 15, 2019 and are due Friday, May 17, 2019. Final amounts for each award level will be dependent on the number of awards and available funding. Others outside of UE and GE are welcome to recognize those within our divisions for their collaborations across campus. I am once again reserving some funds for divisional-level Platinum Awards to recognize exceptionally high-quality work and an exceptional or unique contribution to the unit, division and/or campus. Platinum Award nominations must be submitted by a unit head and no more than two nominations can be submitted per unit. Details on how to submit a Platinum Award nomination will be distributed to unit heads directly. 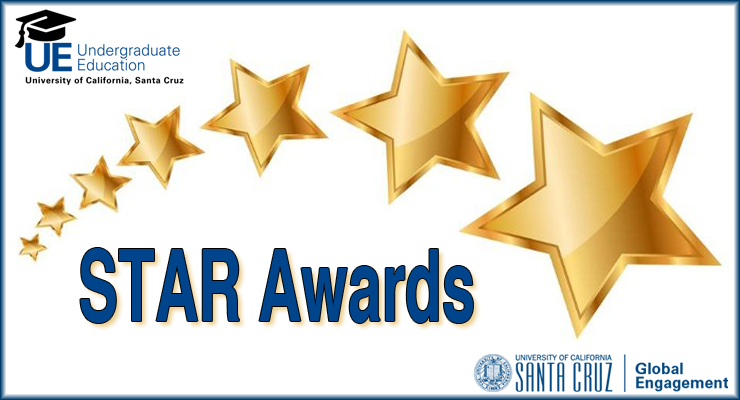 Distribution of 2018-19 STAR awards will be based on nominations received by Friday, May 17, 2019. Represented (with the exception of CX) and MSP employees will be reviewed and recognized, but are not eligible for STAR cash awards. The unit head of the nominee will be asked for comment before the nomination is evaluated. Please direct questions about the STAR program or the nomination process to Daria Troxell (9-2351 or dtroxell@ucsc.edu) or David Abercia (9-4908 or dabercia@ucsc.edu).